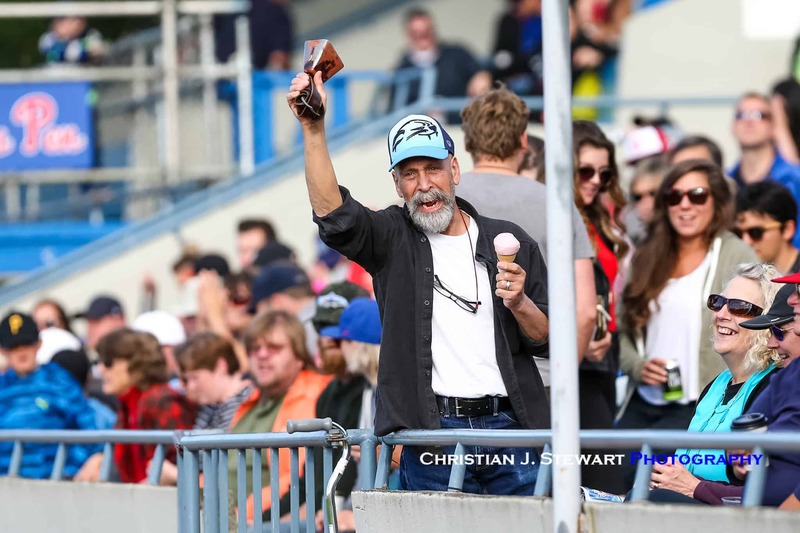 June 30, 2018, Victoria, BC – Perhaps the HarbourCats should run more often before games. 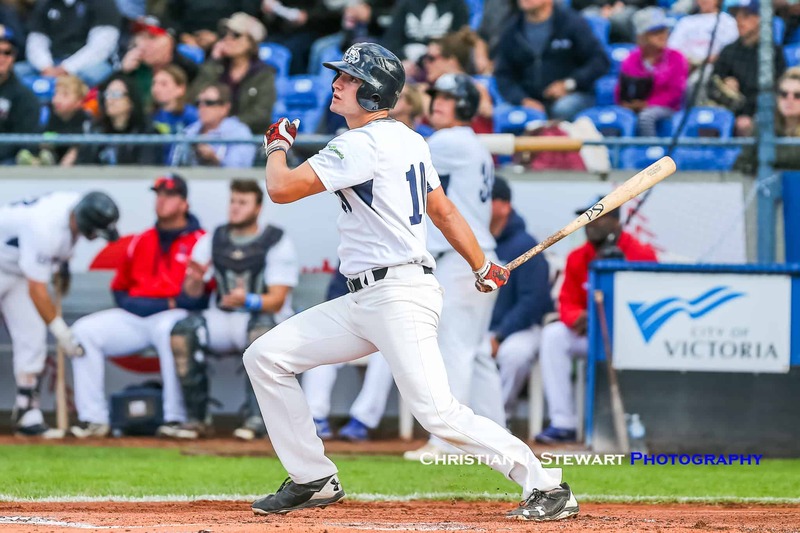 After being put through the equivalent of a hockey “bag-skate” prior to their game against the Kelowna Falcons Saturday night, the Victoria HarbourCats came out with a renewed energy both on the bench and at the plate, pounding out 22 hits, including four home runs, to cruise to an eventual 18-7 win over the Kelowna Falcons in West Coast League action Saturday night at Wilson’s Group Stadium at Royal Athletic Park. 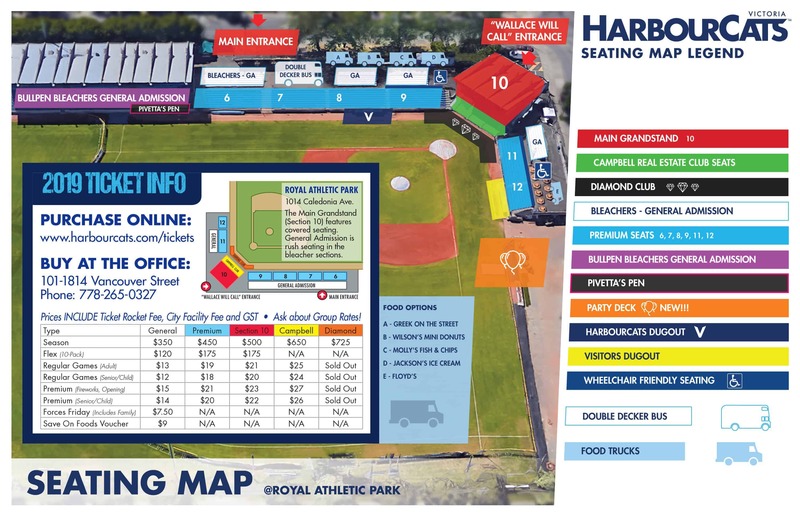 The HarbourCats offensive explosion saw them score 10 runs in the first four innings to jump into a 10-1 lead, with three of those runs coming in the first inning, thanks in part to an RBI-single from Matt Clayton and an RBI-double from Michael Malinchak, and five more coming in the fifth inning, thanks to a three run home run from Dustin Miller – his first of the evening – and a solo shot from Nick Plaia. 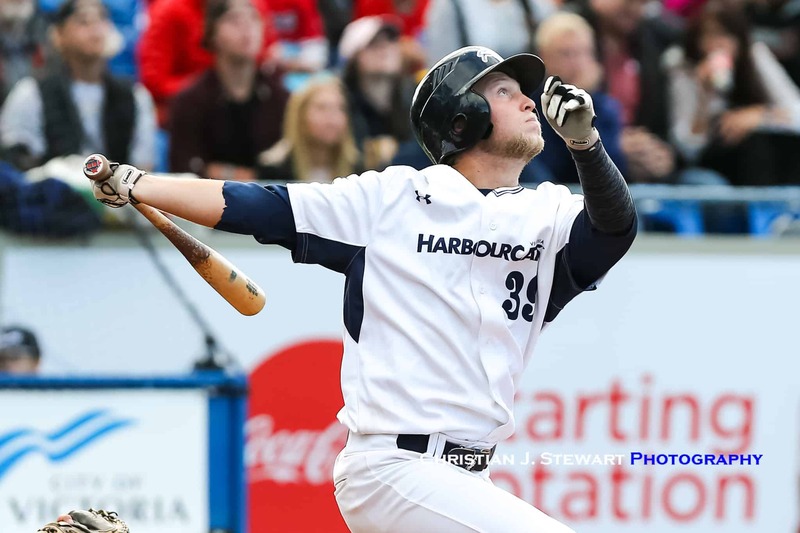 After the Falcons scored three in the top of the sixth, pinch hitter Adam Imwalle got in on the long ball action with a two run home run in the bottom of the inning and after another three spot by the Falcons in the seventh, the HarbourCats would score six more in the bottom of the eighth to put the game away. That six run explosion was highlighted by Miller’s second home run of the evening, a grand slam that bounced off the top rail of the right field fence and sent the 3,135 fans out of their seats to applaud the offensive fireworks before the actual post-game fireworks that they all enjoyed. 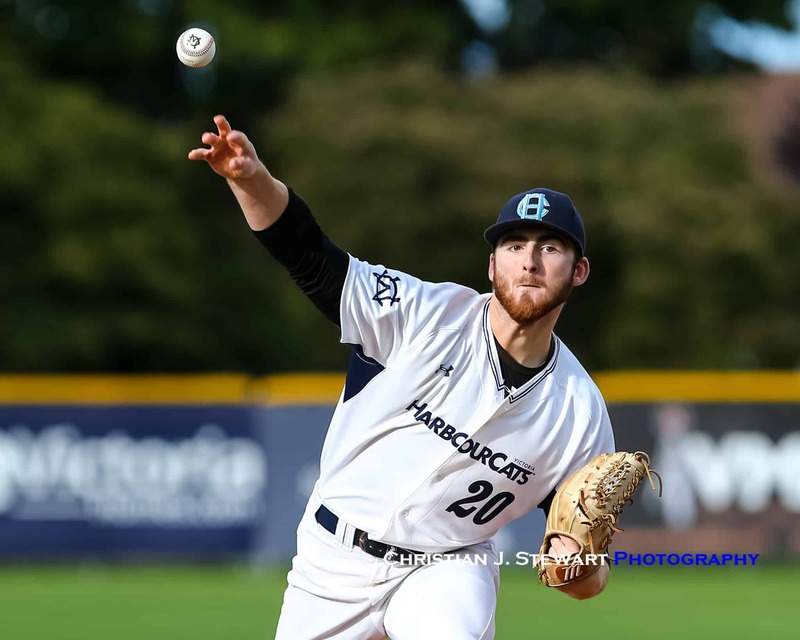 The HarbourCats offensive explosion overshadowed a great start by the HarbourCats pitcher Garrett Goodall, who went five full innings, giving up just one run on six hits while striking out six and walking just one. Goodall was supported in relief by four different pitchers inculding Tyler Yoshihara who went the final two innings, striking out five and who now has not surrendered a run in 14.1 innings of work so far this year. 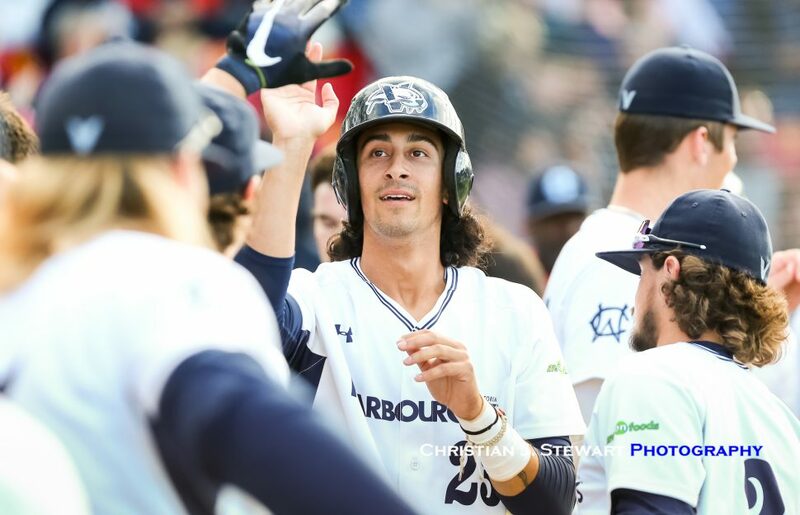 Miller’s night also overshadowed that of leadoff hitter Plaia who had three hits, with a home run, triple and double, three walks, four runs scored and three RBI, as well as that of Dustin Demeter who had a three-hit night with a double and an RBI. For the Falcons, Dan Pruitt led their seven-run and 12 hit attack with three hits, a walk and three runs scored, while Tyler Nixon had two hits, with a double and two-RBI. Falcon starter Jared Akin takes the loss giving up five runs on seven hits in just two innings of work. 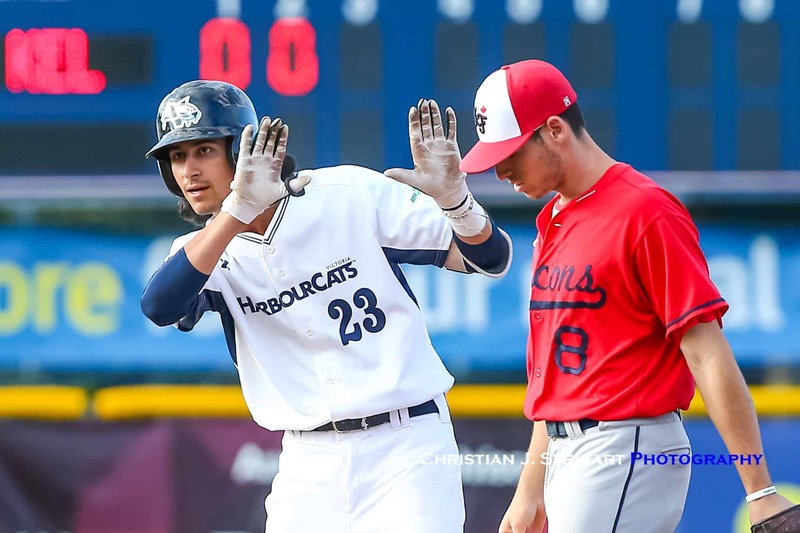 With the win the HarbourCats snapped the Falcons seven game win streak, and set up a series rubber-match on Canada Day tomorrow afternoon at 1:05pm. Be sure to wear your red and white on Canada’s 151st birthday, as Tyler Hilton will get the start in the Sunday matinee.